Deep Dish. Discography. Music. Albums. Tracks. Deep Dish are the duo of Dubfire and Sharam. 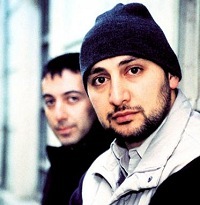 Originally from Iran, they took root in the Washington, DC area in the early 90's and established themselves as top-flight producers and DJ's, releasing several mix CD's (most notably "Penetrate Deeper"). They had successful collaborations with BT and Carl Craig, and several of their remixes were instant classics. Their "Yoshiesque" and "Global Underground: Moscow" mix CD's brought them massive acclaim around the turn of the century, and they now rank among the most popular DJ's in the world. While most of Dubfire and Sharam's productions have the epic, grandiose feeling that ties many a house track to its disco forebear, the duo's knack for tight programming and genre-blending have carried them above many of their dance-chart compatriots. As American leaders in the international dance music arena, Grammy-Award winners Deep Dish have become one of the most revered names in the genre. Their plate is filled with a long-awaited new artist album on deck for release; 100-plus DJ gigs a year from Los Angeles to Lebanon; high-profile remixes for such artists as Madonna, P Diddy, Delerium, Dido and Justin Timberlake, just to name a few; a flourishing business in D.C. consisting of three record labels (Yoshitoshi Recordings, Shinichi Records, Yo!) and a DJ agency, Bullitt Bookings.